My Cecile Brunner Rose bush is in full bloom right now. The roses are small but very fragrant. I was inspired to create a little vignette on my night stand. 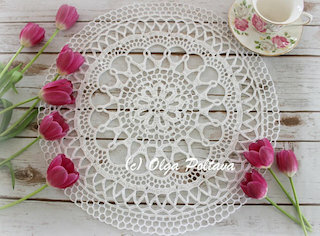 The pink doily is not new, I did share it with you in a post last year (you can see that post here). 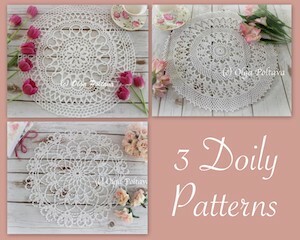 The pattern for this doily is from 1951, and it’s available free here. As I said the roses are very fragrant and it feels so luxurious to wake up in the morning in a room filled with their sweet aroma. Another gorgeous bush has started to bloom in my yard, which inspired me to start a new crochet project. But that’s a secret for now! Thank you everyone who left comments on my previous post. I appreciate your kind and encouraging words. 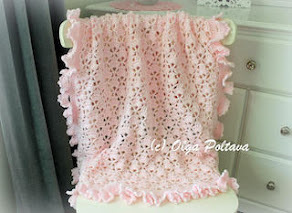 When I started working on this design I intended it as baby blanket, but when I finished it I realized it can make a wonderful lapghan as well. I’m actually going to keep it and use as a lapghan. It’s nice to have something cozy on my garden chair (which is cast iron and therefore gets cold easily) when I’m reading a book or having a cup of coffee in the morning. 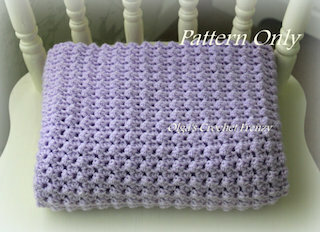 In my free pattern below I included some notes on how to adjust the pattern to make a lapghan in the size you like. Finished Size: about 40 by 33 inches (if you would like to make a lapghan, start with a longer chain, but make sure the amount of chains is a multiple of 2, plus 1). With first color yarn, ch 121 loosely. Row 1: 2 dc in 4th ch from hook, *skip 1 ch, 2 dc in next ch* across, dc in last ch. Row 2: ch 1, turn, sc in same beginning space, sc in each dc across. Attach the other color. Note: you can continue your work without cutting off the first color yarn. 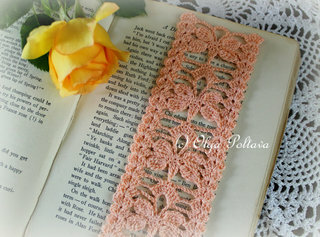 When you finish the last row and make trim, you will crochet trim over the yarn, so it won’t be noticeable. However, if it’s not comfortable for you to crochet having another yarn dangling along, cut off and fasten the yarn after each color stripe. Weave in the yarn ends before making trim. Row 3: ch 3, turn, *skip next sc, 2 dc in next sc* across, dc in last sc. Row 4: ch 1, turn, sc in same beginning space, sc in each dc across. Switch to the other color. Repeat Row 3 – Row 4 until the blanket is about 39 inches long (or longer if you are making a lapghan), ending with a stripe of first color (for example, if you started with pink, end with pink as well). Working in end of rows: sc in each end of row across, 2 sc in corner space. Working in original chain: *sc in next space where 2 dc were made, sc in next ch-1 space* across, 2 sc in corner space. Working in last row: sc in each sc across, join round with sl st. Round 2: sc in each sc around, and 2 sc in corner spaces; join with sl st.
Fasten off. Block if needed. I will gladly welcome any feedback from you on the pattern. I tried my best to write it, but mistakes and/or typos are possible. 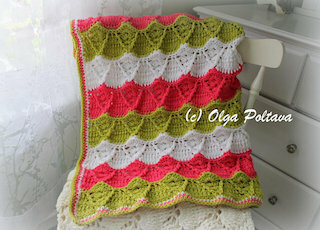 I hope you’ll enjoy making either a baby blanket or a lapghan from my pattern. Pammy Sue from Scotty's Place kindly tested my pattern for a pinafore baby dress that I recently created. Just look how lovely her dress turned out. She also made a lovely headband to match the dress. How cute! The pattern for this baby dress is available in my Etsy shop. Just look what my darling mom got me! No, she didn’t make it (she doesn’t work with crochet thread that much anymore). She found it at her local thrift store for a ridiculous price of five dollars. She thought I might like it. 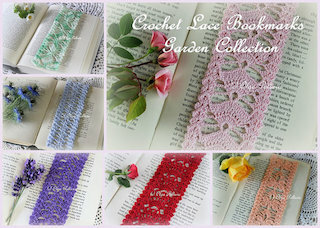 Being a crochet lace fanatic, I absolutely love it! But the best part is that it fits me perfectly. I also like how it looks with the sleeves rolled up. I wonder what the story behind this gorgeous cardigan is. Who was the person that made it? How did it end up in a thrift store? Those things I will never know, but one thing I can tell for sure: whoever made this beauty is (or perhaps was) at the top of crochet art. The cardigan is made of small motives that were very neatly joined together along the way. There is not a single seam on the entire piece! 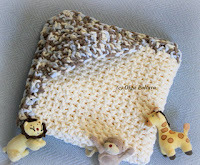 The stitches are neat and even, and the crochet thread that was used is thinner than the common size ten. 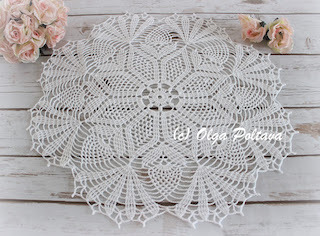 To make such piece requires not only superb crochet skills, but lots of patience and determination. Thank you so much for your warm comments on my previous post. I read and re-read them; your kind words really lifted up my spirits. In the light of the unpleasant incident that recently took place I was faced with a dilemma whether I should invest my time and work into this blog or give it up. I was showered with sincere comments and e-mails from people who actually find my efforts valuable! I am very grateful to you for sharing with me your experiences in similar situations, for your wisdom and advice, and for your encouragement. Yes, I will go on! However, I came up with a list of changes and rules that I’m going to implement on my blog. 1. 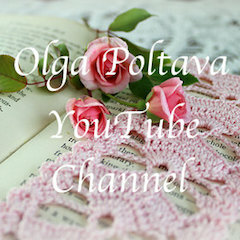 I will not let people take advantage of the hard work that I put into my blog! I will not be afraid to publicly denounce on my blog people who try to make profit of my work selling my patterns on Etsy, Ebay, or other sites. 2. 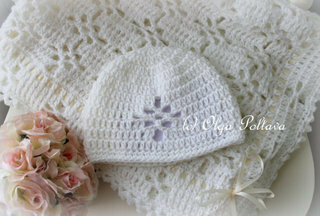 I will put some of my designs and patterns up for sale, and I will not feel guilty about it. My original designs cannot be posted on other sites or distributed in any other form. 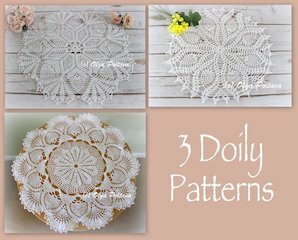 If you would like to share my pattern or tutorial, you can post ONE image on your site with the link to my original post. All the photos on this blog were taken by me (unless stated otherwise) and cannot be reposted without my permission. 4. 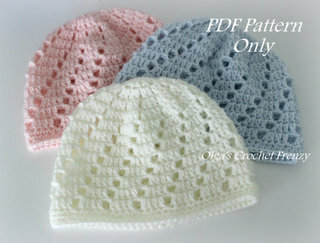 I will no longer provide support and answer questions for my patterns older than one year. This is simply a matter of my time. I now have over 200 posts on my blog, and I can no longer stay on track of all of them. If you have a question or problem with a particular pattern, please read the comments first. It’s possible that I have already addressed the question or problem in the comments. 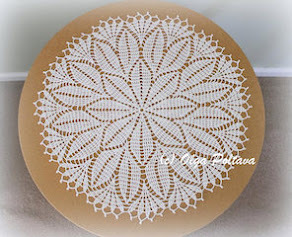 If not, you are welcome to ask for help on crochet forums or discussion boards, but make sure you only give a link to the pattern and not repost it there. 5. I often get e-mails from people asking help with patterns that were not written by me. I’m flattered that you consider me a crochet expert, thank you. 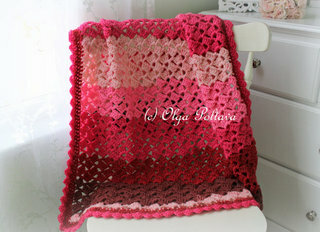 I don’t know everything about crochet, but I do love the challenge of figuring things out. 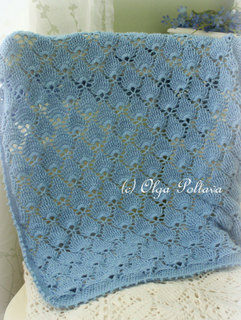 If you want to ask for help or request a tutorial for a particular stitch, please send me an e-mail. I will try to address your request as soon as I can. If I consider that it’s worth sharing I will make a blog post out of it, so that other people in our craft can learn and benefit from it. 6. Please, don’t get upset with me if I don’t reply to your e-mail or comment or do not address your crochet problem. I greatly appreciate them, and I will try to do my best. However, as I already said it all boils down to a limited time on my hands. 7. If you have any suggestions or advice, I will sincerely welcome them.